Game Salute is looking for funding over on Kickstarter for their new card and dice game called Chaos & Alchemy. 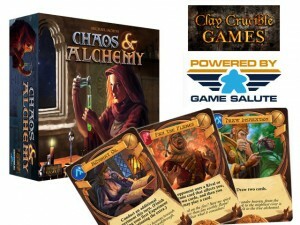 Chaos & Alchemy is a card and dice game designed by first-time creator Michael Iachini. Following a small self-published run in 2012, Game Salute is now working with him to produce an all new version, complete with incredible art from Enggar Adirasa and graphic design by Dann May that will make the game truly stand out.